If you have even the slightest level of arachnophobia -- fear of spiders -- then happening upon a cluster of the eight-legged critters can be downright unnerving. Spider clusters, the collective term for a group of spiders sharing a habitat, are not so much uncommon as they are generally unnoticed in their short time as a group. Different kinds of spider clusters occur naturally in the world. Spiders lay their eggs in many different areas, depending on species and environmental factors. Some spiders keep their egg sacs in their webs, others tuck them neatly under leaves. Others, such as wolf spiders, carry their egg sacs with them until the babies hatch.When spiderlings hatch, all of them in a single egg case do so essentially at once. The young spiderlings often form tight clusters after hatching, where they remain protected in numbers while they feed on their egg yolks. 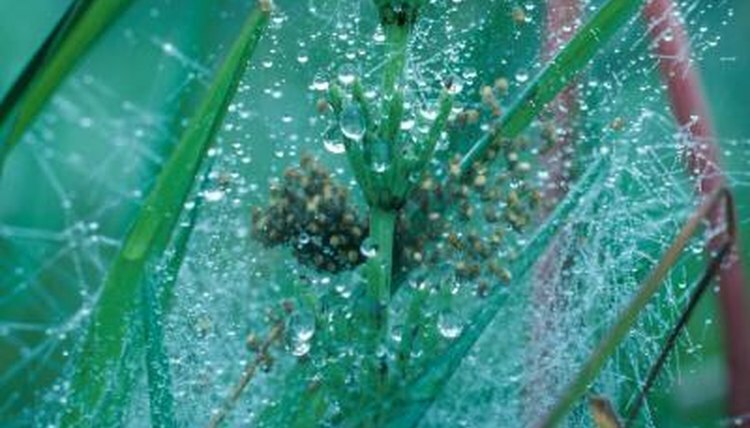 Spiderlings will remain in these tight-knit clusters until they're mature enough for disbursement. In the home, you may notice clusters of hatchlings in corners where webs are. Newly hatched spiders can be remarkably small and, when clustered together, look as you might expect: a small ball or cluster of tiny, wriggling spiders. Many spiders disperse by a method known as ballooning. As the term implies, these little spiders are carried by the wind, much like balloons. To balloon, they raise their rears into the air and release a long strand of silk. Even a slight breeze will catch the strand and carry the lightweight spiderlings hundreds or thousands of feet away -- sometimes miles. Because many spiderlings stay close together until ballooning, and because many groups of spiderlings may be maturing in a small area at the same time, you might see clusters of these tiny travelers all trying to catch the wind in close proximity to each other. Ballooning is often accomplished from a high point: The tips of tall grass or plants and fence posts are common ballooning points. On rare occasion, you might stumble onto a cluster of spiders trailed by long strands of silk. If enough spiderlings all try to balloon at the same time and the wind fails, they'll leave behind so many strands that they appear to be gossamer sheet of silk hanging from their aborted take-off point. Few species of spiders are considered social, but some species live in large family groups. The large clusters of spiders lay out large sheet webs to produce their silken nest. In many cases, these social spiders have a variety of ages present; the youngest spiders tend to be larger in these types of family groups because they benefit from the additional food shared by their older siblings. Some social spiders, including Theridion nigroannulatum, hunt together in packlike structures. No true social spider species live in the United States; they live in warmer climates such as South America. On occasion in the United States, however, you may be likely to come across a loose cluster of American house spiders. These spiders are responsible for cobwebs in corners; often more than a few specimens will build their webs closely together or overlapping. Although harvestmen, commonly called daddy longlegs, aren't truly spiders, many people mistakenly refer to these commonly encountered arachnids as such. Daddy longlegs cluster in the autumn in groups that can be quite large. Groups of a few to dozens of harvestmen tangle their long legs together. These groups may congregate on the sides of buildings or on tree trunks -- pretty much any fixture -- and are quite noticeable.